Your costume looks tredmeous. Its great to know that you won the contest for vegetarian chilli. Also, I'm sure you have better culinary skills, then you give yourself credit. The Last time I cooked, I gave myself food poisoning. Congratulations on your trophy and hope everything improves for you . Thanks very much! Luckily, I haven't given myself food poisoning, but I have destroyed a few pots and pans. And made eggs explode. Care to share your recipe with us? 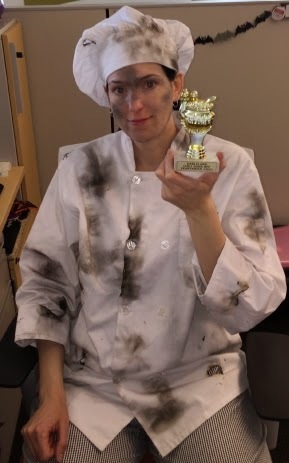 I too was a chef for Halloween- but I was Alfredo Linguini from Ratatouille, and I can't make chili. Good one. :) I think I might have to watch that movie again now. LOL! Will wonders never cease? Congratulations and great costume! Your office sounds pretty fun!